From hurricanes to floods, earthquakes to landslides, wildfires to the monsoons, 2017 was far from normal. While 2017 as a whole has weighed in as a few standard deviations from the mean on many fronts, Mother Nature made headlines time and again for devastating storm and weather events across the world. But as climate change shifts what was once normal, the question now becomes: how can we work across sectors to be more ready next time for this “new normal”? 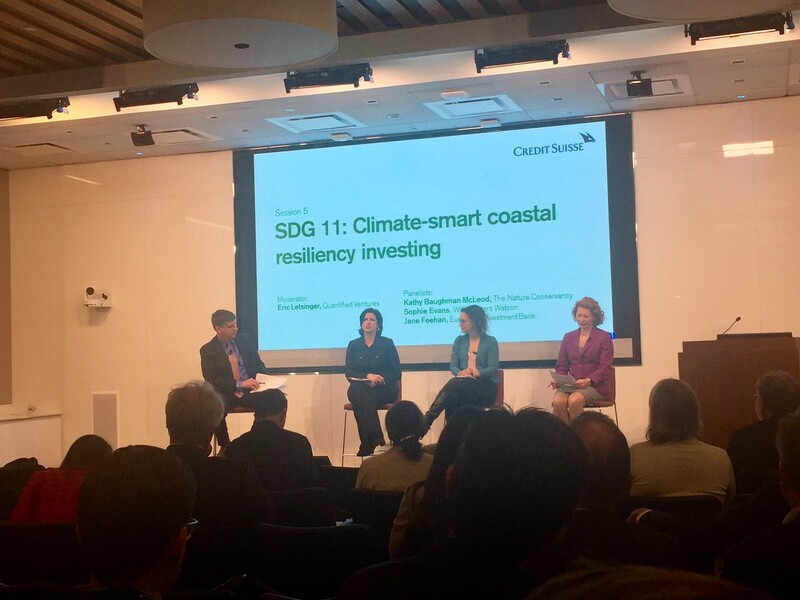 This week, I moderated a panel at Credit Suisse’s 5th Annual Conservation Finance Conference on “Climate-smart Coastal Resiliency Investing.” We had a rockstar panel of three powerful women at the top of their games in this fast-emerging field: Kathy Baughman McLeod (The Nature Conservancy), Sophie Evans (Willis Towers Watson), and Jane Feehan (European Investment Bank). This nets out to a panel of top leaders with deep content expertise across sectors — a managing director from one of the world’s leading environmental NGOs focusing on building markets based on nature’s value, a top-shelf insurance company officer who knows how to quantify and price natural risks, and a global investor with access to significant capital seeking alignment with global environmental objectives. In 2017, Moody’s sent a clear message to public leaders when they announced their intentions to consider local resiliency plans in their municipal credit ratings. These panelists agreed that the impact of this institutional guidance on public leaders is clear: this is a “stick” encouraging municipalities to invest in resiliency measures, and the time is now. Many communities, both in the U.S. and abroad, are still recovering from some of the immediate ramifications for the absence of such plans and preventive actions. These impacts will only deepen and become more devastating if these municipalities’ access to low-cost capital further deteriorates. The solutions in local resiliency plans can, and will, vary. But, according to these panelists, the opportunities in front of us all are to learn from our hard-earned lessons that nature can be our greatest asset in all of this. We can spend less while achieving better results by investing in prevention — smaller, more strategic solutions and natural interventions — as opposed to treatment, such as large-scale, downstream capital projects. Investments in coastal wetlands and reef protection, for example, can restore coastlines that our economy is dependent upon and protect on- and off-shore assets and infrastructure, such as hotels. Green infrastructure investments in cities can reduce the impact of significant storm events, while also reducing the need to make large grey infrastructure investments like storm tunnels and providing benefits like access to open space, to boot. The opportunities are numerous and each panelist reflected on a couple projects that they have advanced since last year’s gathering that reflect well this sea change in approaches. The good news came on a handful of fronts. First, we have better data now and it’s starting to enable these nature-based transactions. It’s not perfect and we have much work ahead to create better standards for asset management, but it’s getting much better, quickly. Second, capital is noticing the opportunities and is assembling to pursue investment opportunities. Third, bankable projects are emerging, on multiple fronts and with growing momentum. As evidenced by the projects discussed by the panel, many have moved past talking to doing. And fourth, Moody’s “stick” has jumpstarted initiatives across the public and private sectors to find “carrot” solutions to complement. While the field of resiliency investing is continuing to innovate, emerge, and mature, it was incredibly clear from these panelists, conference participants, and field practitioners that we covered measurable and significant ground since we gathered exactly one year ago. For those of us who are actively involved in advancing the notions that nature both reduces risk and should be an active partner at the solution and deal table to be priced, predicted, and invested in, this was a measurably productive year. Can’t wait to see where we’ll be another year from now. Eric Letsinger is the Founder and CEO of Quantified Ventures, a for-profit impact investing firm that helps clients finance specific and measurable environmental, health, and educational outcomes. He is a “tri-sector” executive, bringing 25+ years of leadership experience in government, nonprofit, and private sector organizations operating in healthcare, environment, education, and housing.